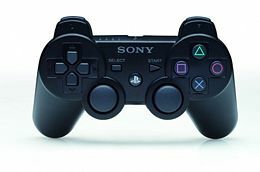 The Sixaxis Wireless Controller is the wireless controller for the Sony PlayStation 3. It is notable for being able to be tilted to further control games such as Grand Theft Auto IV. The Sixaxis can operate wirelessly via Bluetooth; up to 7 simultaneous controllers are supported natively by the console. The main new feature of the controller is the ability to sense both rotational orientation and translational acceleration along all three dimensional axes, providing a full six degrees of freedom. The Sixaxis, while similar in shape to the original DualShock and DualShock 2 controllers, features finer analog sensitivity than the DualShock 2. The controller also features more trigger-like R2 and L2 buttons, with an increased range of depression. In the place of the "Analog" mode button switch of previous dual analog models is a jewel-like "PS button" with the PlayStation logo, which can be used to access the home menu and turn the console on or off. Sony announced that because of the included motion sensors, the vibration feature of previous PlayStation controllers was removed, reasoning that the vibration would interfere with motion-sensing. Some have disputed Sony's reasoning, citing that the Wii Remote controller has both motion sensing and vibration capability. In late 2007 in Japan and 2008 for North America and Europe, Sony released the DualShock 3, which is similar in design to the Sixaxis; however, force-feedback was added to the controller. With the introduction of the DualShock 3, the Sixaxis was discontinued. In PlayStation 3 version of Grand Theft Auto IV there is an option in the controller tab of the pause menu to turn on Sixaxis. Sixaxis can be used for a number of things, and each one can be turned on and off separately, so the player can use Sixaxis for what they want to use it for. Sixaxis is turned off by default. While Sixaxis is turned on, the button associated with the same action still work, so if the player is in trouble they can just hold the controller still and use the buttons. Going to the phone and choosing "Sixaxis Tutorial" will activate a training side-mission; see below. A very quick lesson in which the player learns how to shake the controller to reload. Afterwards, Niko walks into a beacon to move on. Niko rides through several beacons on the runway. Niko pilots a boat offshore from the airport through several beacons. This is the first opportunity players have to use a boat. This lesson serves double duty: it serves not only as a primer on flying a helicopter with Sixaxis control, but also is an opportunity to practice flying in general since this is likely the player's first exposure to flight in the game. Niko has to pilot the helicopter through several rings, and then safely land back on the helipad. Note: unlike the other tutorials, it is possible for Niko to be injured for wasted if the helicopter crashes. Following the tutorial, Niko finds himself standing outside the main terminal and is left to his own devices; any vehicle being driven when the tutorial is activated will be lost. It is possible to exit the runway area of the airport and travel a short distance from the airport using any of the transportation methods provided or on foot, but if you go too far the tutorial fails (a warning message is shown if Niko strays too far). There is no traffic, cops or NPC pedestrians in the vicinity as long as the tutorial is active. Although pigeons cannot be found, it is possible to climb one of the control towers and access a shotgun pickup during the tutorial; normally, attempting to access this pick-up triggers the wanted level. The tutorial can be repeated as desired, making it handy for repeating the shotgun pick-up or practicing flying, boating and motorcycle riding (using the Sixaxis controls is optional - the regular controls also work). Completing the training level isn't necessary for 100% completion. This page was last modified on 7 March 2019, at 01:51.